Heat oven to 350°F. Grease 15x10x1-inch baking pan. In large bowl, combine all bar ingredients except nuts and raisins; beat at low speed until moistened. Beat 2 minutes at medium speed. Stir in nuts and raisins. Pour into greased pan. Bake at 350°F. for 25 to 30 minutes or until toothpick inserted in center comes out clean. Cool 45 minutes or until completely cooled. 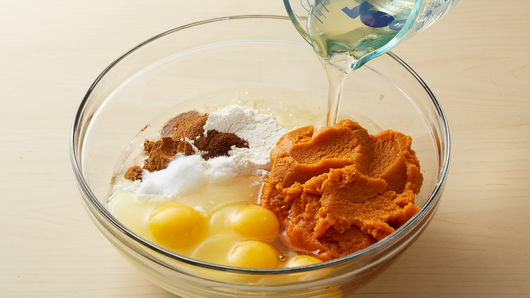 In small bowl, combine all frosting ingredients; beat until smooth. Spread over cooled bars. Cut into bars. Store in refrigerator. 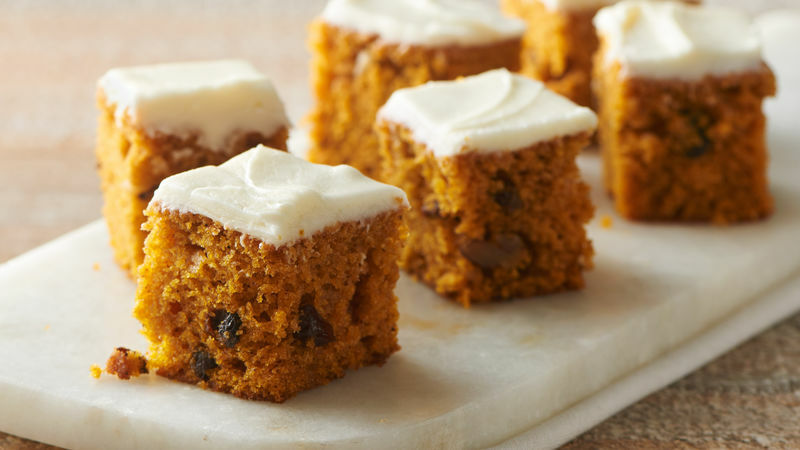 Is it really fall without pumpkin bars? Especially these easy bars! This recipe only requires a few simple steps: all the ingredients except nuts and raisins go in a bowl and get blended together, stir in the nuts and raisins, and pour into your greased pan to bake. It is really as easy as that. While your cake cools, prep the classic cream cheese frosting—this extra step adds a lot of sweetness and decadence to these dessert bars, so don’t skip it! 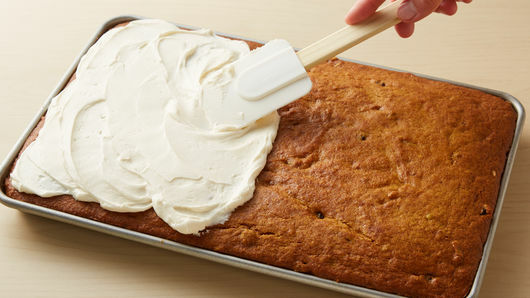 Just remember: it is important to let the cake cool completely before topping so your cream cheese frosting doesn’t melt into your pumpkin bars. This fall favorite is perfect for potlucks and large gatherings since it makes forty-eight servings. If you can’t get enough pumpkin in your life you should try out these other pumpkin bar varieties.